We happen to believe that four packs of bacon are better than just one. And four different kinds of bacon are definitely better than two. Come to think of it, we just believe that more bacon is better! And this Four Pack Bacon Combo says it all! With four different flavors of bacon, you can sample just a small part of our bacon world. Or hey! Maybe that isn't enough! Maybe you want six... or twelve! (And of course we have six and twelve packs! More is always better, isn't it). Get your four pack today! Flavors vary from photo according to availability and season. Not only is the bacon ... baconlischous, I had to have the delivery date changed quickly and it was done, without hassle, without questions !!! Great product and excellent customer service ! Okay, there is some sadness in this review. Okay, there is some sadness in this review. I sent this four pack to a relative and their response was "it's the best bacon we've ever had!". The sadness part is that I've only sent this product as gifts to family members. They all say the same thing though; it's the best bacon they have ever tried! Time to send myself some!!! Seems a good price for an interesting gift for someone who does not need more clothes or stuff. 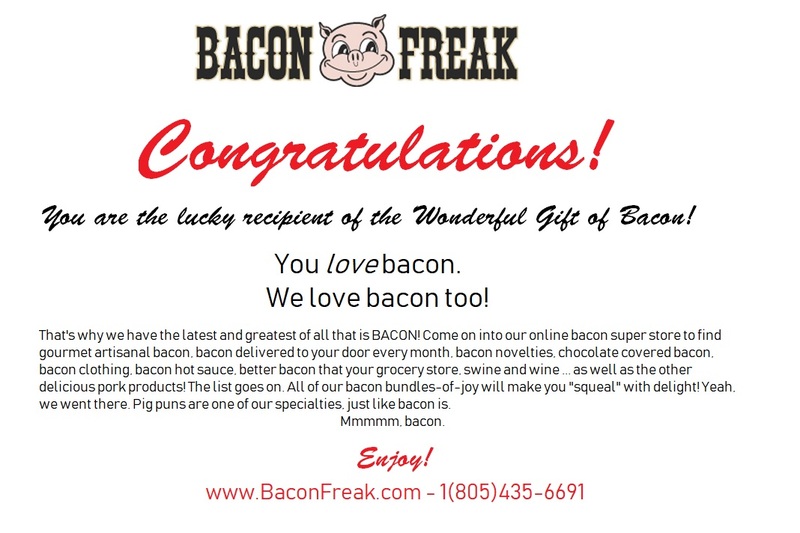 I wanted to get my nephew something special for Christmas...he loves...loves...bacon and all you can do with it ...I wasn't sure if there was a company that dealt with bacon lovers....and I was so so so happy to come across bacon freak.....it is just what I was looking for to shop for him...variety is great....love this company...thank you. Their was one flavor i did not care for but my daughter loved it so overall its a good value. Great bacon, much better than anything from the supermarket lol.